Helping To Make Your Classic MG More Affordable! Mattborn Classics Helping To Make Your Classic MG More Affordable! 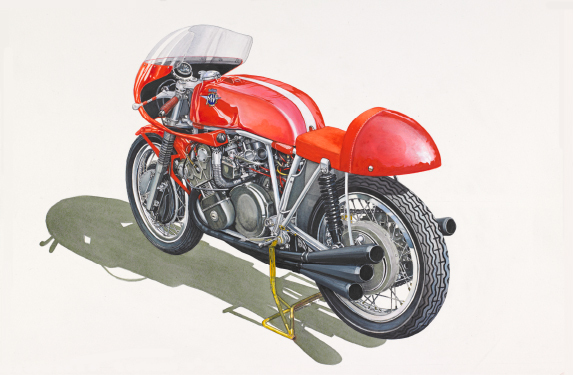 Welcome to Mattborn Classics Motorcycle Art Gallery. 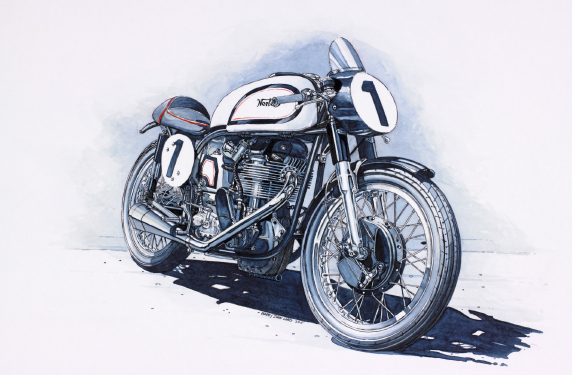 We are proud to showcase and present a selection of watercolour prints of Italian and British Motorcycles by Barry a local artist. Prints are available for purchase at the cost of £30.00, plus post and packaging. Barry is available for commissions and can offer you a unique piece of art in graphite pencil, coloured pencil, water colour and pen, for further details please contact us. 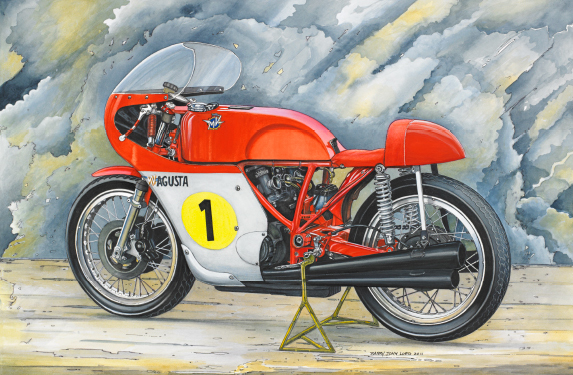 From 1966 until 1973 the 500 MV Triple was raced with much success by Giacomo Agostini; this is the last version of this magnificent air-cooled 12-valve 7 speed machine, revving to 12,000 rpm and weighing 118 kg (dry) 78 HP, and a top speed of 26 km/h. The sound from the three tapered megaphone exhausts is music to all motor cycle racing enthusiasts, especially when heard in isolation on the Isle of Man TT Circuit. The Manx Norton a British racing motorcycle and is probably one of the best looking racing motorcycles ever, 47 BHP at 6,500 rpm and a price tag of £481, 2s, 5d. Even though Norton had pulled out of international grand prix racing in 1954, the Manx had become the backbone of privateer racing giving the private racer, a real chance of getting on the leader board. British engineering at its best! Based on a photograph that was taken in 1989 at Brands Hatch, this machine is part of the Albaldo Elly collection of historic MV Augustas. Raced once by Englishman John Hartle at Monza in 1958 when lying fourth, the motor suddenly cut out and he retired from the race. With the withdrawal of Gilera and Moto Guzzi from racing in 1957, the six had no real competition so was abandoned. With a six speed gear box 75 HP, 15,000 rpm, dry weight 145 kg maximum speed of 240 km/h. an impressive looking machine with its triple megaphone exhausts up each side and of course the six Dell’orto carburettors sitting under the sculptured fuel tank, wonderful Italian engineering.